Brandywine is said to be the gold standard of heirloom tomatoes. The large potato leaf vines produce fruits weighing up to 2 lbs. 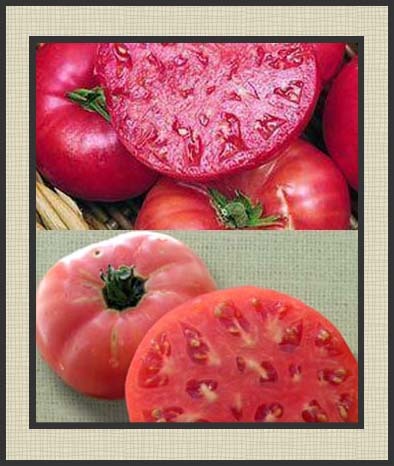 with excellent, mild, balanced heirloom flavor. Brandywine takes a while to produce ripe fruit, sometimes up to 100 days. We grew both Red and Pink Brandywine tomatoes for the first time last year. I was fascinated with their leaves. They were huge, like something from prehistoric times. I’ve heard of people complaining of blossom end rot with these, but never saw the first sign with any of the 8 plants we grew. They do tend to crack. I have read if you water consistently you can prevent this. I have to disagree. But, so what they crack, what is pleasing to the eye is seldom pleasing to the tongue. These tomatoes were plump and firm and huge and tasty. If you’ve got the room, and can start them indoors, grow these.